Willy Brandt is born Herbert Ernst Karl Frahm on 18 December 1913 in Lübeck’s workers’ district. He grows up in turbulent times: the years of his childhood and youth are influenced by the First World War, the November Revolution, the Weimar Republic and the disintegration of Germany’s first democracy. 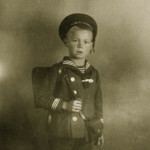 The bright working-class youngster is able to attend the Gymnasium (university preparatory school) and earns his university entrance certificate in 1932. Firmly anchored in the workers’ movement, Herbert Frahm soon manifests political and journalistic talents. At the age of 16 he is already a member of the SPD (Social Democratic Party) but soon changes over to the Socialist Workers’ Party (SAPD) in 1931. On 18 December 1913 at 12:15 p.m., Willy Brandt is born Herbert Ernst Karl Frahm at Meierstraße 16 in the workers’ district of St. Lorenz in Lübeck. He is the child of 19-year-old salesclerk Martha Frahm and 26-year-old John Möller, a bookkeeper and later teacher from Hamburg. Father and son will never meet each other. On 26 February 1914, the boy is christened in the Evangelical-Lutheran parish of St. Lorenz. Because of the extra-marital nature of his birth, the ceremony does not take place inside the church but rather in the parsonage. 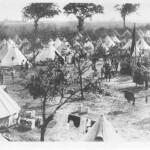 Beginning in August 1914, the First World War rages for four years, claiming a total of 17 million victims. 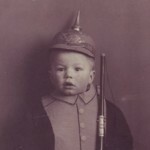 Ludwig Frahm, little Herbert’s grandfather, serves in the war as a German soldier in France and survives the fighting. By the autumn of 1918, the military defeat of the German Reich is certain. In Kiel, the sailors’ revolt against continuing the war leads to the downfall of the monarchy in Germany. Kaiser Wilhelm II abdicates on 9 November 1918. In Berlin, the republic is proclaimed and the social democrats take over the government of the Reich. The citizens of Lübeck sense relatively few effects from the upheaval. The previous mayor remains in office. Universal and equal suffrage gets introduced in the city-state. For work-related reasons, his mother, Martha Frahm, has moved into Lübeck’s town centre. She only sees her son once or twice a week. On workdays a female neighbour takes care of him during the day. On 13 April 1920, Herbert Frahm is enrolled in the St. Lorenz Boys’ Middle School on Lübeck’s Marquardt Square. His grandfather Ludwig Frahm sees to it that he does not go to primary school, otherwise a later transfer to a higher school would not be possible. Herbert, like his grandfather, having previously spoken only the regional dialect Plattdeutsch (Low German) now learns High German at the boys’ school. He is rated among the best of that year. 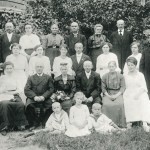 The Frahm family is firmly anchored in Lübeck’s Social Democratic Party and its organisations. In 1922, Herbert’s mother, Martha Frahm, enrols her son in the children’s group of the local Workers’ Gymnastics and Sports Association. A year later he also joins the Workers’ Mandolin Club. 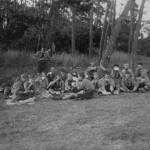 In May 1923, the boy takes part in an excursion to Hamburg with the children’s group of the Workers’ Sports Association. During a visit to the trade union hall at Besenbinderhof, the 9-year-old is witness to the founding of the Socialist Workers’ International, which meets there from 21 to 25 May 1923. In 1923 the difficult economic situation leads to work stoppages throughout Germany. In June, 3,700 metal workers in Lübeck go on strike. Among them is also Ludwig Frahm, who works as a truck driver for the Dräger Factories. During the walkout, one of the directors of the factory gives two loaves of bread to the hungry 9-year-old Herbert Frahm. When the boy comes home with them, his grandfather demands he take the loaves back immediately: “A striking worker doesn’t take any gifts from an employer. We want our rights, not gifts,” Ludwig Frahm admonishes his grandson. Herbert then proudly carries the loaves back to the bakery. In the autumn of 1925, Herbert Frahm joins the social democratic “Reichsarbeitsgemeinschaft der Kinderfreunde” (“Reich’s Association of Friends of Children”). The eight- to fourteen-year-old members are called “Falken” (“falcons”) and are familiarised by older comrades with the ideas of the workers’ movement as well as encouraged to read, discuss and lecture about them. Herbert’s mother Martha also takes him along to activities of the worker’s association “Friends of Nature Lübeck”, where the boy gets his regular share of fresh air. On 26 April 1927, Herbert Frahm enters fifth grade A of the Von Großheimschen secondary school in Lübeck. Based on his previous excellent achievements, he is exempted from paying tuition. In the summer of 1927, Herbert Frahm travels abroad for the first time. He takes part in a German-Danish student exchange programme with the industrial town of Vejle which is situated ca. 100 km north of Flensburg. 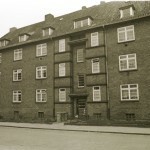 On 17 September 1927, Herbert Frahm’s mother, Martha, marries the 47-year-old bricklayer foreman Emil Kuhlmann and moves with him to 136 Hansestraße in Lübeck. 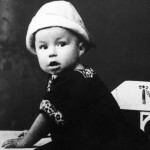 Their son Günter is born in February 1928. Later, the Kuhlmanns take in a foster child who remains with them until the age of consent. However, Herbert continues to live with his grandfather, Ludwig Frahm, and his wife Dora whom the thirteen-year-old cannot abide. 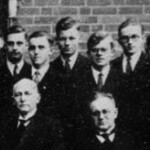 On 1 April 1928, inside Lübeck’s town hall, Herbert Frahm receives the socialist “Jugendweihe” (“Youth consecration”), the secular equivalent of the Evangelical-Lutheran confirmation. Nevertheless, he takes part in religion classes at school. He also regularly attended Sunday school classes during his childhood. Willy Brandt will later distance himself more and more from the church; however, he never officially leaves it until his death. 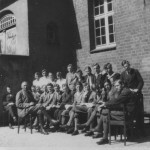 On 17 April 1928, Herbert Frahm transfers to the Johanneum, a modern reform prep school in Lübeck. As before, he is not required to pay tuition. The atmosphere at the school is liberal and characterised by tolerance. Herbert’s favourite subjects are German and History. 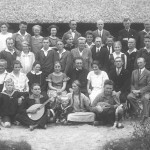 In July 1928, Herbert Frahm takes part in the Estetal Children’s Republic. The three-week-long tent city camping event is organised by the SPD’s “Reichsarbeitsgemeinschaft der Kinderfreunde” (“Reich’s Association of Friends of Children”). Hundreds of workers’ children spend a part of their school holidays in the so-called “red children’s republics” which have existed since 1927. At the summer camp, children and young adults are expected to learn how to organise living together and governing themselves in democratic structures such as general assemblies and camp councils. In 1928, a total of eleven children’s republics are established within all of Germany. In April 1929, the „Rote-Falken-Gruppe“ (“Red Falcons Group”) of the “Friends of Children” led by Herbert Frahm is transferred to the Socialist Workers’ Youth organisation (SAJ). The SAJ is the SPD’s youth organisation for 14- to 18-year-olds. In Lübeck, the young politician leads a group of “Red Pioneers” which bears the name “Karl Marx.” Herbert’s political role models are Rosa Luxemburg and Karl Liebknecht, the co-founders of the Communist Party of Germany (KPD) who were murdered in 1919. In July 1929, Herbert Frahm travels for four weeks to the children’s republic on the Rhine island of Namedy near Andernach. It is his first lengthy trip in Germany. A large general assembly takes place in Cologne’s exhibition hall, to open the summer camp and greet its participants. 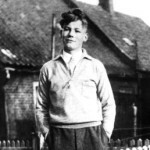 On 28 July 1929, 15-year-old Herbert finds himself behind a radio microphone for the first time, which was set up in front of the parliament building of the children’s republic. Together with other boys and girls, the young Lübecker present songs, speaking choirs, theatre scenes and speeches which are broadcast live by the West German Radio Network AG (WERAG). Until the end of August, a total of nearly 5,000 children and young adults from the workers’ movement take part in the Namedy children’s republic. On 11 November 1929, Ludwig Frahm moves with his wife and grandson to Trappenstraße 11a. The apartment located in a new building has two rooms, a separate kitchen and a modern bathroom. Herbert gets his own room, a six-square-metre size attic space where he reads voraciously and learns how to be alone. In the summer of 1930, at the age of only 16 years, Herbert Frahm becomes a member of the SPD. Thanks to Julius Leber’s advocacy, an exception is made for him, for the statute of the party actually requires a minimum age of 18. For the last couple of months, the young social democrat has already been chairman of the five-member district executive committee of the Socialist Worker’s Youth (SAJ), which has 200 members in Lübeck. As a “Red Pioneer” Herbert carries a considerable degree of self-confidence. In an article for the “Lübecker Volksbote” in September 1930, he directs “Ein Wort der Jugend an die Alten” (“A young person’s word to his elders”) advocates “struggling for socialism” together. In his opinion, young people are ready to do that and are hoping for fellow combatants. But those comrades with their “eternal experiences and serenity” and other “manifestations of old age” should just as well stay at home. 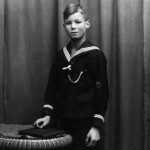 In July 1930, in the Bay of Lübeck, Herbert Frahm takes part in the fourth children’s republic. To open the conference on the first evening, the play “Hans Urian goes looking for bread” is performed in the Hansa-Theatre. In the proletarian-revolutionary children’s fantasy by Béla Balázs, the main role is portrayed by the 16-year-old Herbert. However, he has not memorised his lines so that the prompter has a strenuous job of reminding him. On 18 July he leaves the summer camp for a week and travels with 60 other members of the Socialist Workers’ Youth (SAJ) to the International Workers’ Youth Conference in Copenhagen. From 1930 on, the National Socialist Workers’ Party of Germany (NSDAP), led by Adolf Hitler, gains more and more adherents. From the very beginning, Herbert Frahm courageously opposes the NS movement. 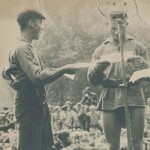 In newspaper articles and in assemblies of the Socialist Worker’s Youth (SAJ), the young politician denounces the Nazis’ agitation and terror campaigns. 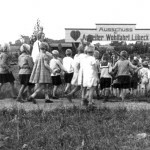 From time to time the disputes between adherents of the “Hitlerjugend” (“Hitler Youth”) and the SAJ become increasingly violent. On the evening of 5 August 1930 in Lübeck, a brawl breaks out. Six SAJ members are subsequently charged with bodily injury. Herbert Frahm is also among those charged, although he was verifiably not present at the scene. 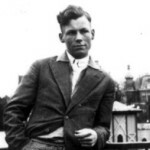 In November 1930, he and his friends are exonerated by a local criminal court in Lübeck. He and his friends in the Socialist Workers’ Youth (SAJ) are especially critical of the fact that since autumn 1930, the SPD has been tolerating the presidential cabinet of the centrist politician Heinrich Brüning, whose party does not even have a majority in the Reichstag. The SAJ disputes the party’s leadership claim. Even Herbert Frahm stresses the independence of the youth organisation, which is indeed affiliated with social democracy but does not owe it any accountability. In the middle of 1931 in Lübeck, Herbert Frahm becomes acquainted with the trade school student Gertrud Meyer and falls in love with her. She is a member of the Socialist Worker’s Youth (SAJ) in the group named “Ferdinand Lassalle.” The two remain a couple for eight years. 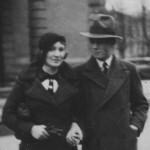 On 4 July 1931, together with a friend, Herbert Frahm travels to Scandinavia for three weeks. Among other places, he visits Copenhagen and Bergen, then hikes across the Norwegian mountain range to Oslo. Norway’s beautiful nature and landscape as well as the people there greatly impress the 17-year-old. He even learns a little Norwegian. 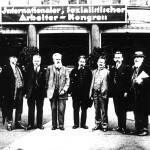 To clear up the dispute between Lübeck’s SPD and its youth organisation, Julius Leber invites the leading officials of the Socialist Workers’ Youth (SAJ) to a discussion scheduled for 20 October 1931. But Herbert Frahm and three additional SAJ leaders refuse to take part in the discussion. Together with 180 disappointed social democrats and SAJ members, they leave the SPD and join the new leftist revolutionary Socialist Workers’ Party of Germany (SAPD). Frahm takes on leadership of the SAPD’s local youth branch. The break with the SPD also ends his collaboration with the “Lübecker Volksbote.” The 17-year-old must also write off a promised stipend for subsequent university-level studies. On 18 February 1932, Herbert Frahm passes his graduation exam at the Johanneum in Lübeck. He receives the grade “excellent” in history for his essay on August Bebel. His essay in German on the benefits of schooling for young people also receives an “excellent” from the technical instructor, however he then sees it reduced to “good” by the form master. 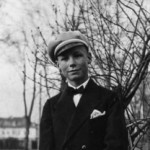 Because he has no money for university studies, Herbert Frahm starts working as a trainee at the Lübeck firm F. H. Bertling Shipping Agency, Ocean Carrier and Transport Company KG, beginning in May 1932. For 30 reichsmark a month he helps captains of ships arriving mostly from Scandinavia with tax formalities, with verifying weight measurements and offering them return-voyage cargo. In his free time, the 18-year-old devotes all of his energy to the Socialist Workers’ Party (SAPD). “The little party leader” speaks at assemblies, writes and distributes leaflets and organises lecture series.